The iTunes service streams music files that are located on the NAS to iTunes users on the local network. Simply install iTunes on your PC or Mac and use it to playback the music files on your NAS. Enable iTunes Service Select the check-box to enable the iTunes service. The current state of the service is displayed as “Service is stopped” or “Service is running”. Server Name Specifies the name of the iTunes server. Music Folder Click Browse to specify a folder on your NAS to be scanned for music files. Only one directory can be selected but it will also scan the files in the sub-directories. Rescan Interval Specifies how often to scan the music folder for new files. Apply Click to apply and save the changes. 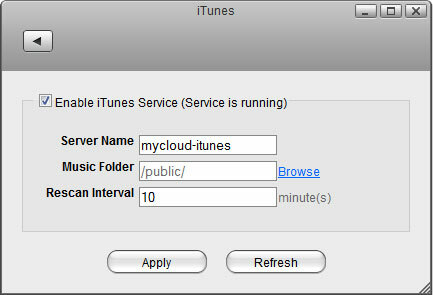 For more information about how to use the iTunes music server, please see File Management > iTunes. Following file formats are supported by the iTunes server: *.mp3, *.m4a, *.m4p, *.ogg, *.flac.